Hi All! Today kicks of the first ever "Oldies by Goodies" Wednesdays here, and on the Technique Junkies Facebook Group. Each Wednesday, we will celebrate stamps that have been released at least a year ago, reminding of our hidden gems! Today my "Oldie" is a trio of stamps that were released last March (2016). I can't believe how much I use these stamps, and how many times I have combined each of them with other stamps. The main image is Veiled Woman. To color her, I used Copic Markers, just adding touches of Caucasian skin tone to her features and lips. She really doesn't need much coloring! 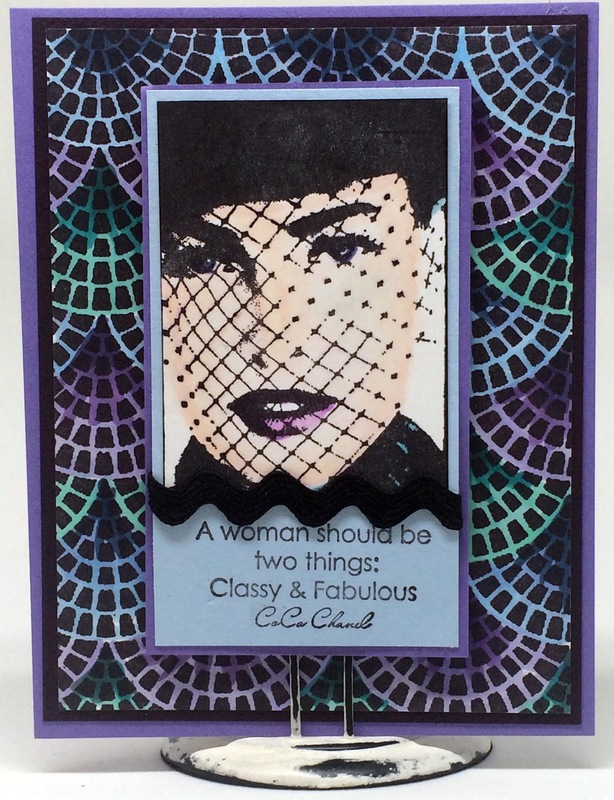 I layered her over the Classy and Fabulous sentiment, using a piece of Rick-Rack as a transition. For the background, I used Copic Markers to color the Mosaic Scallops background stamp. 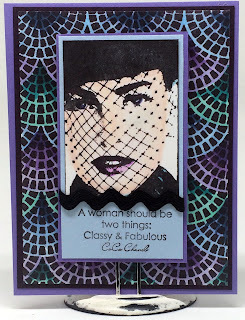 I wanted to create layers with this stamp, so I colored the smaller portions of each scallop with darker hues and lightened up each scallop with lighter hues as they "fanned" out. One of the things I REALLY like about this stamp is that it can be used with the scallops facing up or down -- it is pretty either way! Today was also the first Blog Hop that our new Design Team Co-ordinator, Jeanne Streiff, managed. I feel so lucky to have her on our team! Wasn't her work just spectacular? As usual, you will receive 15% off any April 2017 New Release Stamps through April 8, 2017. Just place any of the new stamps in your shopping cart and they will be discounted at checkout. Ready for a couple more pieces? I love this little gem of a stamp, called Flower Square. I stamped it with London Gray Memento Ink, then did some simple coloring with Pastel Pencils (I LOVE those things -- they blend like a dream!). Out of all of the April stamps, this one was my lovely surprise - it turned out exactly as I would want! Next, I used the Row of Birds stamp. 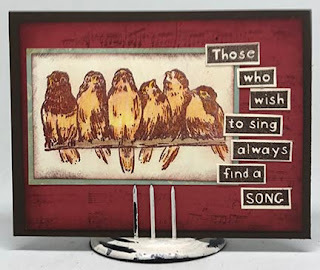 I stamped them with Timber Brown StazOn ink and colored the birds with Pastel Pencils. 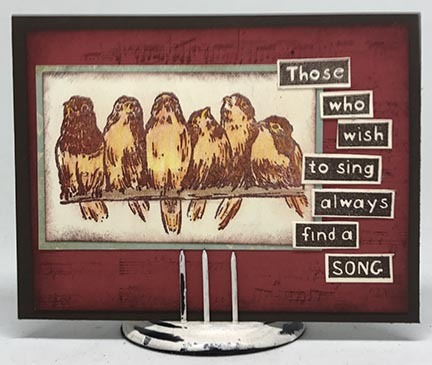 The birds are layered over a maroon panel stamped lightly with the Vintage Music Stamp (previously released) and paired with the Always Find a Song (also previously released) sentiment. I love the way my birds turned out, but did you see Jeanne's? Divine! Finally, I used the Mom Anchor stamp. 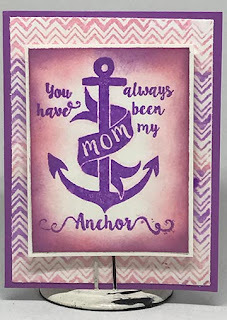 This stamp tends toward the masculine, so to feminize it, I stamped it with Wilted Violet Distress Oxide Ink. I sponged both Warm Lipstick and Wilted Violet around the edges (my lord these things blend like a dream!). 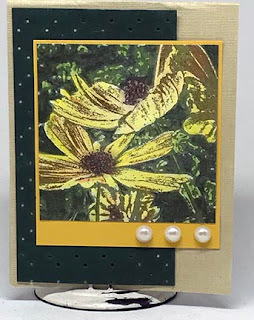 The background is Fresh Chevron (previously released) that has been swiped with the same two colors of the Oxide Inks and sprayed with Art Anthology Gilded Gold Fairy Dust. This has AMAZING gold sparkle! I hope you have enjoyed our hop this month. Go shop! Remember, the 15% off the new stamps ends April 8th, and if you picked up a discount code from one of the Designer's Blogs, you can use that for 10% off the other stamps, too.